Lena Dunham has a very pretty rock on her finger these days from her boyfriend, Jack Antonoff. The couple’s anniversary is coming up, and Antonoff celebrated by buying Dunham a turn of the century moonstone. The ring is gorgeous, and the gesture is very sweet — it’s also very confusing. 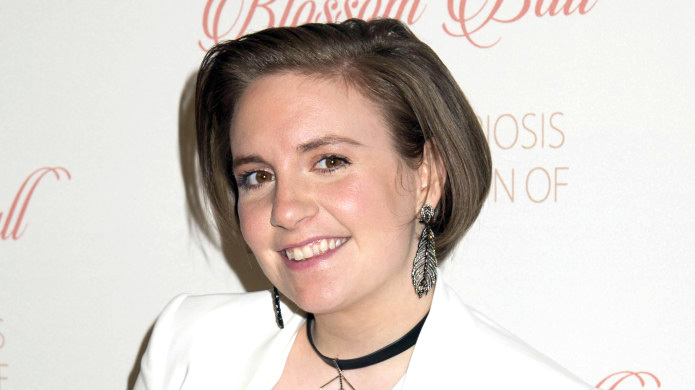 Dunham is always very quick to dispel any rumors that she and Antonoff may be planning to walk down the aisle. Last year, when asked whether she is planning to get married she even went so far as to say, “I love my boyfriend, I’m very lucky to call him my life partner, but you will sooner see me pregnant with twins.” Sends a pretty clear message, I’d say. I fully support Dunham’s opinion and right to choose exactly the way she wants to live her life. Here’s what I don’t get. How exactly is committing to one man forever and wearing a ring he gave you different than marriage? Sure, there’s no ceremony, and there are no legal papers, but the intention is essentially the same. And also, why is being married (or pregnant with twins for that matter) a bad thing? Many people would love to do either or both of those things. Just because Dunham doesn’t want either of those things in her life, doesn’t mean she gets a free pass to judge them. Dunham has made a habit of making sweeping statements that border on judgment, and I think it’s time someone push back on her for it. There is room enough for everyone’s choices. Her opinion of what is right and wrong for her life isn’t automatically what is right or wrong for everyone. More than that, on the outside, she is behaving exactly like someone who is married. What is the big deal? Whether or not she and Antonoff ever get married is up to them. All I’m hoping is that Dunham stops making the rest of us feel bad for making choices she doesn’t agree with.